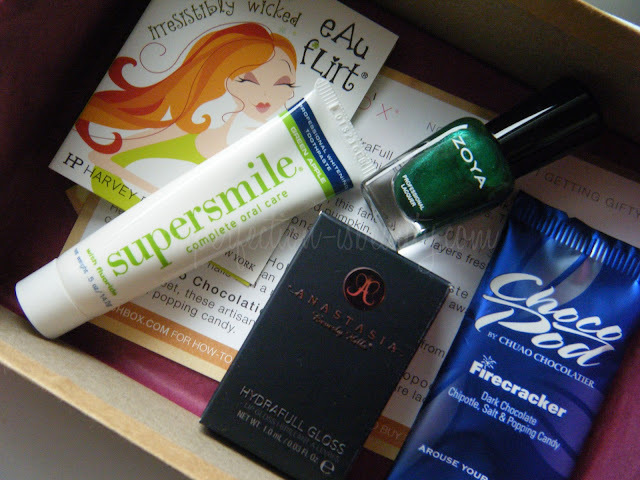 So yesterday I received my November Birchbox, and I'm pretty happy with this box considering many other boxes weren't all that great. At least their is products I can get some use of. This box is inspired by the holidays with a collection of gift-worthy products. Give the gift of volume and shine with this high wattage gloss. The pretty pink shade flatters all skintones. Pearly Whites? Yes, please! This quick-working formula lifts away surface stains for a gleaming grin. Here's one type of jewel we can afford: this emerald polish from Zoya's holiday 2011 collection glams up nails with a metallic finish. Spicy and sweet, these artisanal dark chocolate treat are laced with chipotle and popping candy. This is actually my first Anastasia lipgloss, which I'm super excited to try. The perfume smells amaz and I love all the layers of scents. The toothpaste is a little weird I usually only like minty flavor toothpastes so it being a green apple I must try it before I knock it though. 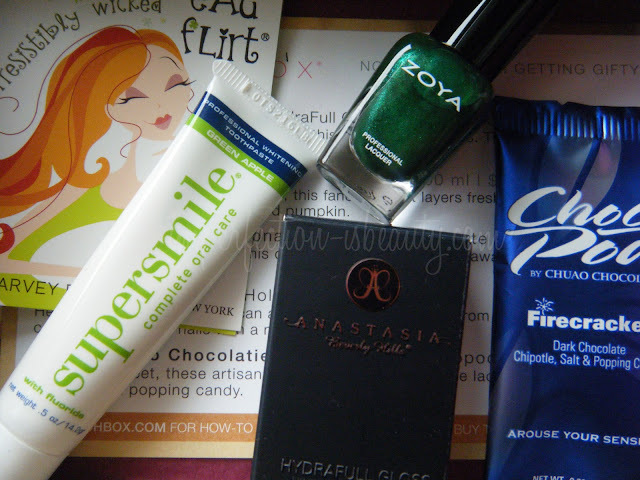 The Zoya polish is probably my favorite product in this box. I love the whole jewel tone polishes this season, its very trending and perfect for the holiday season. The treat is interesting. Chipotle? with chocolate. Overall I'm pretty happy with this box. If I love something I will purchase a full size and do a full review. This looks really good, I get glossy box in the UK, it never comes with chocolate though! Oh man! Looks like a good box, Zoya polish, I always have wanted to try and that color looks amazing. Also, for those items you don't like, you should consider swapping them on MakeUpAlley. half wish we had this in the UK, because that polish is amazing!